Where can you get Guaranteed Return without locking in your capital for long in the uncertain world today? You should consider short-term endowment plans. Endowment plan is the simplest form of investment. You pay a premium to the insurer promises you a guaranteed return in a fixed number of years. In the past couple of years, short-term endowment plans become very popular in Singapore. With the stock market crash in 2018, global uncertainty and escalating US-China trade war, a lot of people are not sure where they should put their retirement funds in 2019. If you are a very conservative person, you may consider the latest offer by China Taiping Insurance, i-Save (i-盈). This is 3-year single premium endowment plan with 2.38% GUARANTEED compounded interest. If you put in $100,000, you will get back $107,320 in 3 years’ time, Guaranteed! It means for every dollar you put in, you get back 107.32% of it. Is 2.38% a Good Return? How does this compare to other retirement options in the market now? Since this product is also covered under the Policy Owner Protection scheme, which protects in the event if the insurer goes under, it is comparable to the following products. I would say it is a good deal. Who is China Taiping Insurance? I have blogged about some products offered by China Life Insurance. You should note China Taiping Insurance and China Life Insurance are two different companies. But both are reputable insurers from China. You can check China Taiping Insurance’s profile here. In fact, China Taiping insurance has started doing business in Singapore since 1938. Many Singaporeans have purchase motor insurance from China Taiping Insurance before. The special offer is for the business launch of their Life Insurance division this year. As a licensed financial adviser, we are an authorized distributor for this product. Available to anyone between ages 1 and 80. The minimum premium is $20,000 and the maximum premium is $500,000. The plan is only available for cash subscription, SRS is not allowed. Leave your comment below if you have any question. If you are interested in this offer, please book an appointment using the form below. Kindly indicate your preferred date and time in the remarks. 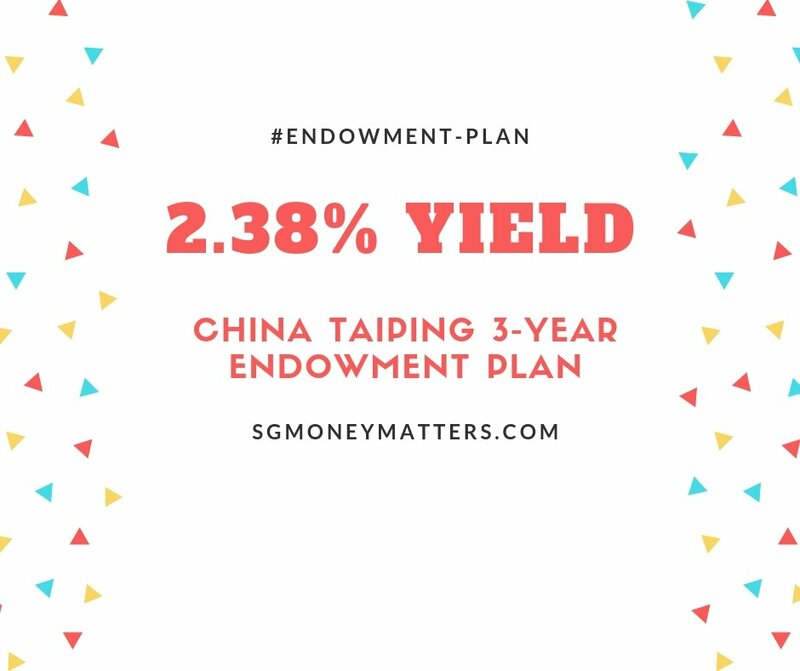 The post Best 3-Year Endowment Plan: China Taiping Offers 2.38% Guaranteed Yield appeared first on SGMoneyMatters. Previous Previous post: SI Research: China Sunsine Chemical Holdings –Flashing A Buy Sign?